Exactly one year ago, while I was laying with my legs up in the air recovering from a surgery, Anything Palmeiras was born. With visits from a total of 117 countries and counting, the blog is today the most vital source available for information in English about S.E. Palmeiras. On this the first of birthdays I’ve chosen to pay homage to the man who gave me those initial and fascinating insights to the backstage of S.E. Palmeiras; who wrote about my team with not only passion but also sensibility, grace and wit; who made me believe that change was not only possible but eminent; who by example guided me in finding my own way of contributing to making Palmeiras bigger, better and stronger. The homage, in the form of an interview, is my way of saying “thank you” to the parmerista Conrado Cacace of Verdazzo. I hope you readers will enjoy it! Anything Palmeiras: Conrado, tell me: is your entire family made up of palmeirenses? Or are there any “black sheep”? AP: What is your first Palmeiras memory? CC: It’s the Brasileirão 1978 campaign. We had a great year, but unfortunately we lost the finals to Gaurani. AP: When did you grow a political conscience? When did you decide to become a member and get active in the club? CC: Right after we got relegated to the second division and Mustafa Contursi was re-elected, I knew I had to try to make something. Two years later, when Mustafa was able to propel his candidate Affonso Della Monica into winning the presidential run over Luiz Gonzaga Belluzzo, I took the decision and became a member, in February 2005. AP: Do you have any personal political aspirations? Are you for example aiming at becoming a consigliere in the future? CC: I’ve already reached what I want: be on the inside, and fighting. The role I’m playing is just a matter of circumstances. AP: Do you nourish a general interest in football? Do you for example watch an entire game between two other club teams? CC: Sure thing, especially when there’s a strong rivalry on the pitch. AP: Conrado, in regard to the rapid expansion of the so called “midia palestrina”, what are the main reasons for this growth in your perception? CC: Palmeiras fans are odd. We don’t get satisfied with the traditional press coverage, we need to talk between us. We know better than anyone what’s right and what’s wrong with our team. The growth of Internet technologies made the rest. AP: I have a sensation that the “midia palestrina” is quite unique in Brazil, both in terms of quality, diversity and sheer volume. But this is just a feeling, I’ve never in fact studied other team’s social networks. Have you? What is your take on our media vs. the media/networks of other teams’ supporters? CC: I’ve never done any research either, but I’ve got the same feeling. I think it’s a consequence of the needs I talked about before. Palmeiras may not have the largest number of supporters, but we indeed do more talking and discussing in addition to being the craziest supporters in the world. AP: After that disastrous finish in the 2009 Championship, you announced what could only be understood as an almost complete “retirement” from Palmeiras due to the strong feeling of disappointment and repulsion (not only with Palmeiras but in particular with the CBF and all the shady business going on). How was that experience for you and for your family? How long were you absent? What made you come back? CC: It was strange. 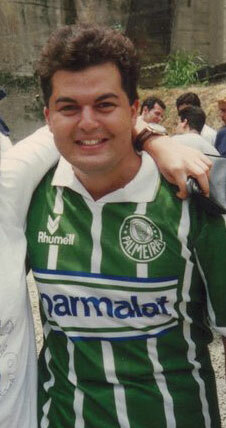 Palmeiras is part of my personality, I think. I decided not only to stop writing, but stopped watching the matches as well. I felt like if some part of me was missing. It was a two months absence – one of them during the seasonal break. But I had to come back for three reasons: 1) I couldn’t stand it; 2) lots of readers, especially the ones living far from here, showed appreciation and a surprising NEED to have my posts back; and 3) the Verdazzo project. AP: Conrado, is Palmeiras more of a passion or more of a drug? CC: Both, in equal portions. AP: Gazing into your personal crystal ball, where will Palmeiras be in 10 years time and what are the main reasons for this development? CC: The revenues from our new Arena will give us significant resources, but money without a good management is nothing. It all depends on how long Mustafa’s bad influence will persist. AP: And to round things off, a couple of bonus questions! The first one: which are your three favourite jerseys of all times? CC: 1) 80’s (with Agip sponsoring); 90’s (the Parmalat era); and 3) 2008 edition (the first dark-green revival from Adidas, with FIAT sponsoring). a) watching the Palmeiras game? c) sitting 30cm from Diana Bouth? CC: Definitely watching the game. Being on TV or beside a beautiful woman is OK. Actually, being calm is the right thing to do in these situations. 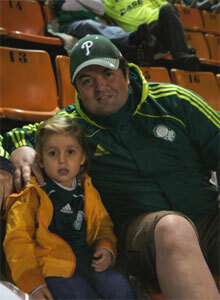 But look: she gave me a hug (distance 0cm) just after Palmeiras had scored a goal, and I was on TV. I think I had a heart attack. pictures: Conrado in 1978 with his brother Rafael; in 1993; and with daughter Cecilia in 2011.